Itʼs ofﬁcial. It was one of those days. It rained all day. Our lip balm tubes decided they didn’t ﬁt into our pouring trays, and after hours of shoving them in anyway, we realized that after we made it work, the caps would now be impossible to remove. Now we have to send the tubes back and it’s holding up production for at least a week. But regardless, the kids got hungry at dinner time. I tried to avoid this as much as possible by letting them snack on dried mango and whatever else they could. It didn’t work, though, so I heated up a big pot of chicken soup and experimental Gluten-Free kneidle I had made over the weekend. I have made very delicious GF kneidle before, but these were not it. So they had some soup but were all still hungry. Which brings me to the point. How many last minute dinner ideas are in your cabinets? Well, here is another one. Not totally guilt free, but actually not so bad. I always happen to have a pot of organic brown rice in the fridge. I probably make something that goes with rice at least once a week, so I always make a little extra. This way when everyone decides they want something else, we just make nori cones. The reason its so delish is the sauce. Now, the first time we had nori cones was at the local, awesome, Teaneck Fish Market, and the sauce was actually a complex and high quality teriyaki. This is not what I make. I just pour soy sauce and maple syrup into a bowl in about equal amounts, sometimes I drizzle a little toasted sesame oil or olive oil in there too. Mix it up in a small bowl . Then make the nori roll. All you do is take a sheet of nori – yes, the seaweed used to make sushi – and fold it in half so you have a rectangle. Then you roll it into a cone shape. Start with folding one corner in and roll. It may crack a little as you go but just ignore it. Remember, you are just pretending to make diner at this point but really you are just filing up those little tummies so you can get them into bed. 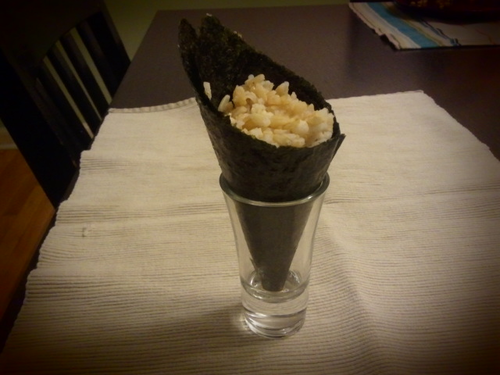 Then while holding your nori cone, stuff it with rice, and spoon on some sauce. My picky eater will eat 3 or 4 of these. Now how bad is this as a dinner in the grand scheme of things? Nori is super packed with minerals, has some signiﬁcant protein, anthocyanins, ﬁber and so on. Brown rice is at least whole grain, and gives them enough calories to make it to breakfast, has good B vitamins, and ﬁber and so on. Anyway, it’s no wacky mac, and it’s super quick and a sure bet in my house.